Saturday afternoon’s splendid weather drew me out of the house after completing some work. With only a couple of hours to spare, I decided to head down to Garry Point Park and see if I could tempt a trout or two. The tide was at its lowest, so there wasn’t much expectation for sightings of salmon. My success of salmon fishing at Garry Point Park has been limited over the year. Beside a few coho and chinook jacks and pink salmon, I’ve only seen chum salmon rolling at times. The mouth of the Fraser River is simply too wide so returning fish tend to spread out. Water clarity had degraded slightly due to rain from earlier in the week, but it was still very favorable for spincasting. In the couple of hours that I had, I managed to miss a solid hit and witnessed two followers to shore. It was rather uneventful but relaxing since expectation was low in the first place. I managed to take some photographs as usual. This young swan fed around me most of the time. It was probably one of the swanlings that we encountered back in the summer. 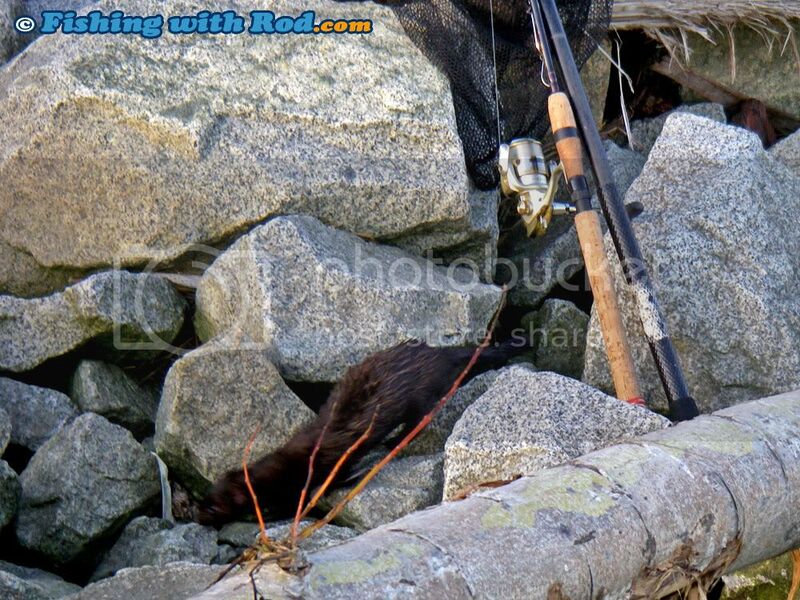 This mink swam across a bay to me and was quite interested in the fishing gear. 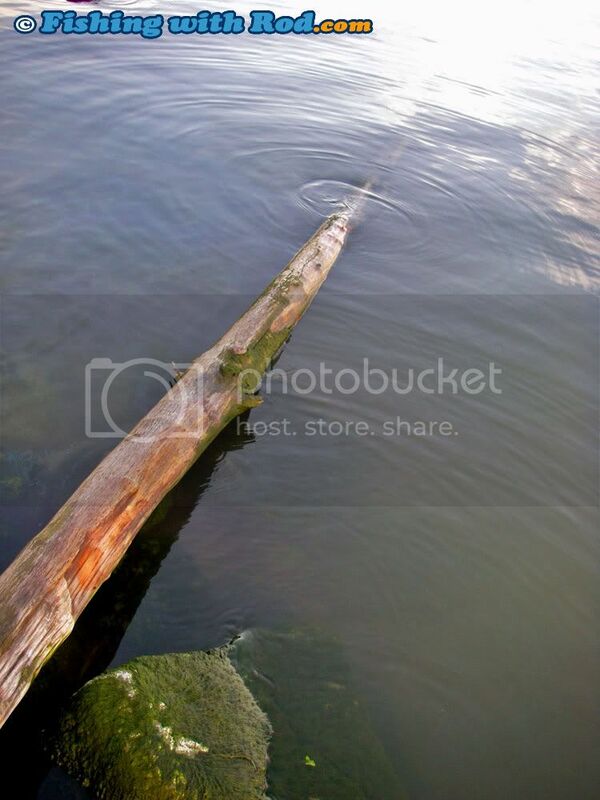 Half-submerged logs are perfect hangouts for trout, char and pikeminnows around Garry Point Park. Sunday’s sunshine could not be wasted so I headed back to my usual salmon hunting spot in late morning. The strong flood tide was around 2:00pm so the timing could not be better. 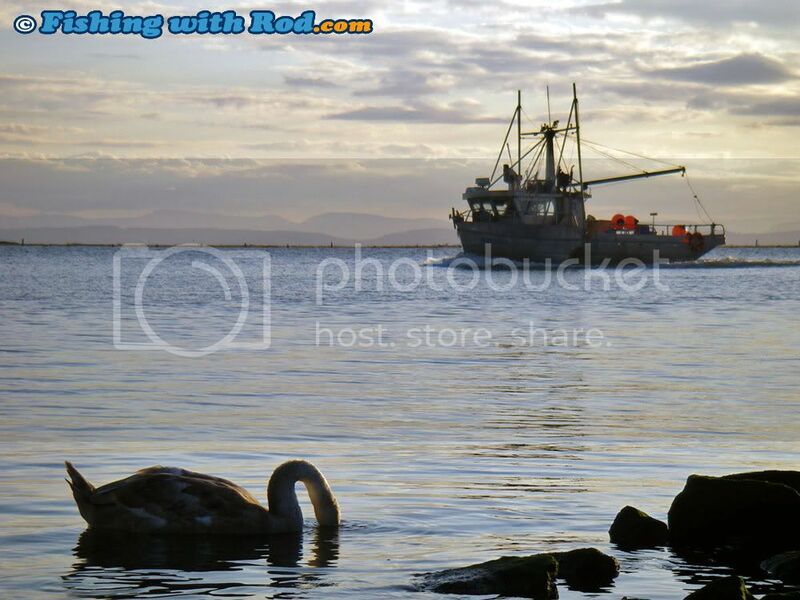 I arrived and found Harry, an old timer, fishing with roe. We had a long chat about how the fishing has been since the Tidal Fraser reopened. I met Harry on a rainy day at the same location in October 1997 while driving around and looking for new fishing spots. I asked what he was fishing for on that day, but he was quite guarded with information, which was very understandable. While chatting, he hooked into a good sized fish that made us running around the bar for awhile. With no one else around to help, I volunteered to net the good sized chinook salmon for him. The day after that, I returned with my spinning rod and lures. He watched with skepticism. It took me no time to connect with a coho or two right away on a 1/4oz Gibbs Croc. The rest of October in 1997 was fantastic, I would race back from UBC in the afternoon to catch the last few bites before dark. During two particular outings, I managed to hook over ten adult and jack coho salmon while roe produced only a few for others. The fishing has been good at times after 1997, but it has never been that good again. These days Harry seems excited when I show up to fish beside his roe rod. Having a spincasting angler beside his bait is a good way to determine if there are fish around. If there are, either one of us would find them. If both techniques do not produce, then it is safe to conclude no fish are coming in. Unfortunately, no fish indeed came in on this day. Beside one chubby bull trout that I sluggishly shook off my spoon, none of us had a single bite from 10:00am to 3:00pm. After leaving the spot alone for two days, I was ready for more punishment. The magic coho salmon period has passed, yet none of us have hooked any beside a few jack coho salmon. This afternoon I poked the water with my spinners and spoons right before flood tide. Chum salmon could be seen rolling from time to time, which was really not that unusual considering the in-season Lower Fraser run estimate is now up to 2.1 million fish. Flood tide went by and no action could be found beside one solid hit that I missed. Once outgoing tide started picking up, some bites appeared. 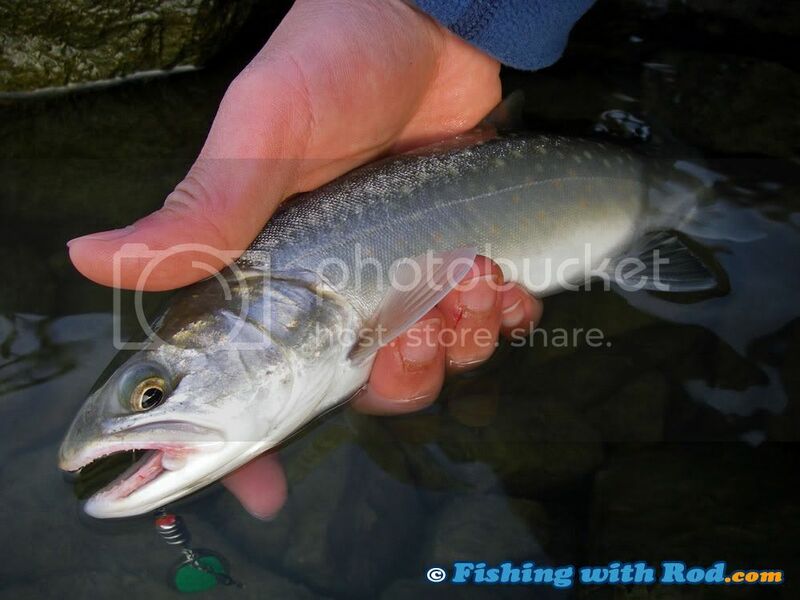 I hooked this bull trout that looked rather underfed. It is rather snake-like. Its partially torn jaw suggested that it had been hooked previously. This type of injury is particularly common on catch and release species. Just before sunset, I felt a good tug during one retrieve. I missed it and continued reeling. Another tug came shortly, which I also missed. On the third and strongest tug, I set the hook and the fish went for a rather strong run, peeling a good amount of line off the reel. This was no bull trout I thought. Excited, I said, “Coho! Coho!” It continued dashing from side to side, resembling how a coho salmon would behave. The runs ended pretty quickly and it surfaced right away as if it gave up the fight. I took a closer look. With ten outings banked, one cutthroat trout, two northern pikeminnow and over a dozen bull trout but no coho landed, I can almost assume that my Tidal Fraser River fall salmon season will end with a big zippo for coho. I say almost only because this weekend’s outings may still bring unpredictable result. After all, it is fishing. 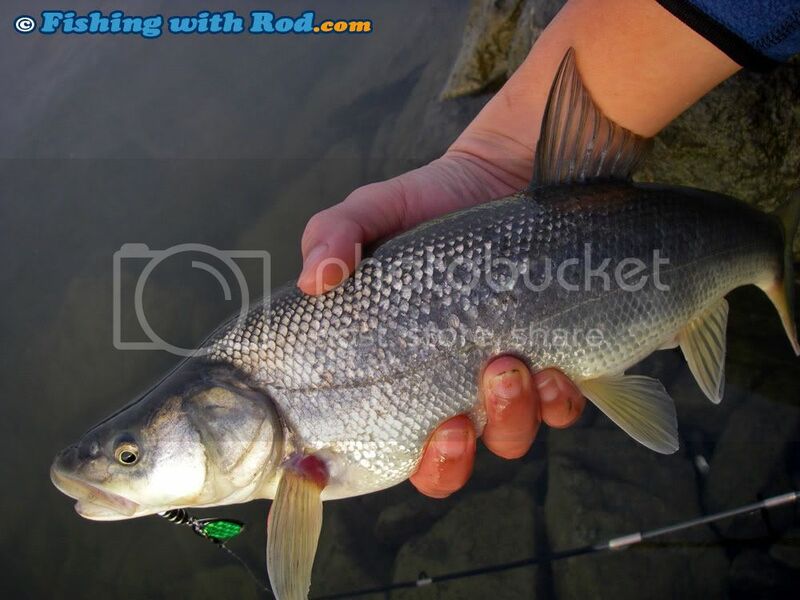 This entry was posted on Thursday, October 23rd, 2008 at 2:25 pm	and is filed under Fishing trip. You can follow any responses to this entry through the RSS 2.0 feed. Both comments and pings are currently closed.